Great schools are build on a foundation of knowledge, understanding, and drive to see the each generation of students be prepared for whatever adventures life has in store. The Apple Creek District was organized in 1878. At one time the district had three schools. Today only Apple Creek School #1 remains. The name Apple Creek was likely taken from the nearby stream running through the district. With over 100 years of history, the enrollment, length of the school term, size of the building, and the number of teachers has fluctuated greatly. Early census records from 1898 indicate there were 15 students. The length of the scholterm had varied from three months, six months, seven months, and nine months. The one room school has expanded to add a second building with a basement, a third building, and a portable classroom. An early photo of the school shows an attached teachers boarding room with a stable in the background. Information taken from conversations with Lois Laemmle and an article written by Lois and Mrs. T.D. 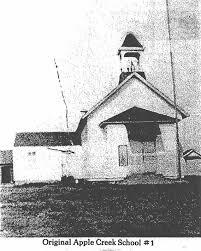 Sullivan titled “History of Apple Creek School #1.” The article can be found in Burleigh County: Prairie Trails to Hi-Ways: Taylor Publishing Co. Copyright 1978.